Crate of Good is a quarterly subscription box that focuses on making a positive social impact with each box they sell. The best part is that you get to choose which impact your purchase goes towards from one of four global causes: Animals, Children, Environment, or Poverty. For $59.99/ quarter + free shipping, you will receive several unisex products ranging from accessories, household items, and even clothing which they offer in sizes XS to 2XL that are tied to specific causes within those four categories. This box was sent to us at no cost for review purposes. (Check out the review process post to learn more about how we review boxes). The Products: Each quarter you will receive unisex items such as accessories, household items, clothing (sizes XS to 2XL), and Crate of Good exclusive collector’s items all of which support the four chosen causes for the quarter. I love that we start making an impact right away! This sticker informs us that to offset the cardboard used for this box, one tree has been planted. When I first opened the box, I was impressed to find this note that is personally signed by the box founders with some nice messages. I love that they put it so simply that they are a “group of guys who care about leaving the world a better place than when we got here” and that they are so eager to include subscribers in their mission and even invite them to share causes that are important to them for future box ideas. Another great thing about this box is that each of the items is accompanied by a card like this one that tells you about the product you received and how this product is making an impact. Each quarter they choose four different causes to support that fall under the four categories they thought were globally felt: Animals, Children, Environment, and Poverty. I love how transparent they are about who they are helping and how! Impact: Provides rescued wolves with the essential vitamins and supplements it needs. LARC is an animal rescue center in Los Angeles that offers combat veterans a therapeutic work environment that provides housing and food for rescued animals, mainly wolves and wolfdogs. I think that this is such an awesome cause in that it helps both veterans and animals in need and it’s the perfect example of a good symbiotic relationship. Find out more about what they do here. The beanie itself is nicely made and I love the embroidered detail on the front along with the great unisex gray color. It’s a great design and the hat itself is soft as well as thick and warm. You can see it’s a bit big on my daughter here, but since it is nice and stretchy, it should fit just about anyone! This is a good universal item and I think anyone in my family will be happy to wear this one for some warmth! Impact: Supporting after-school programming for at-risk youth in Chicago. BUILD is a program in Chicago that is dedicated to youth development whether it be through gang intervention, violence prevention or by helping them focus on their future by encouraging them to stay in school. Their mission is to “engage at-risk youth in schools and on the streets to help them realize their potential and contribute to their communities.” They have been around since 1969, which is really impressive and it gives so much more meaning to this handmade bracelet that we received! Read more about what they do here. I love the simple design of the brown wooden beads with a few gold beads throughout, but what I loved the most was the note that came attached to it. How can you not love the fact that a 15-year old made this for you? This was made at an after-school art program and they are sold in order to support future programs. What a great way to occupy these kids while engaging their creativity and allowing them to contribute to supporting future programs in their own community! Impact: Removing plastic waste from the environment with these sunglasses made out of 70% recycled plastic. Blue Planet Eyewear is an eco-friendly eyewear company that creates reading glasses and sunglasses out of recycled plastic or natural materials such as bamboo. This company is really about giving back and to achieve this, they will donate a pair of corrective glasses through their Visualize Change Program for every pair of glasses they sell. Employees of Blue Planet also do volunteer work in their community as a part of their Random Acts of Kindness Program. What a great company to highlight and support! I was really impressed with the presentation and quality of these sunglasses. I absolutely love the drawstring case which is incredibly stylish with its burlap-like material and brown leather (faux leather?) label and it even came with a microfiber cleaning cloth with the Blue Planet Eyewear logo on it. I think that the color and style are another great universal choice that pretty much anyone can pull off – even if you have a large head like me! These are so comfortable and lightweight and the lenses are polarized which is a real treat! Stylish sunglasses that are saving the environment and also supporting a company with a mission of giving back? Yes, please! Impact: Providing soap and clean water to impoverished children. This bar of soap comes in a beautiful wrapper and it is made from 98% natural, plant-based ingredients. It is also vegan and palm oil-free, but the best part is that every purchase of a bar means that one bar of soap and 30 days of clean water will be given to a child in poverty! Hand in Hand works with “My Neighbor’s Children,” a world-wide child advocacy group to donate soap and clean water to the children of Haiti. It started with a simple mission of providing soap to help prevent illness in impoverished communities, but now this husband and wife team have donated over 1 million bars of soap and helped to build or repair four wells which are responsible for providing clean water. You can even see photos of the trips they take to Haiti, which I think makes it so personal! Read more about what they do here. This is a nice hefty bar of soap and it smells amazing! It really is frosted pine in a bar with scents of pine, a hint of cinnamon and maybe a hint of vanilla or something equally sweet! This soap smells so fresh and the scent is not necessarily masculine or feminine, but definitely, one anyone can enjoy. Although, it does remind me of winter and Christmas, so it may be more of a seasonal scent. I would love to have this scent in a candle because it is that good! Impact: share the mission of a charity that helps children heal through a peer support program. Can I just tell you that I love this shirt? The idea behind it and the sweet drawing are so special! Ele’s Place is a “nonprofit, community-based organization dedicated to creating awareness of and support for grieving children and their families. Through peer support group programs, Ele’s Place helps children to cope with the death of a parent, sibling, or someone else close to them.” I can’t imagine how difficult it would be to lose a parent or loved one at this age but to be a child and lose someone is so much more traumatizing. This sounds like such a great cause and I love that the design on the back of the shirt was drawn by a child who utilized this program. It gives so much meaning to this simple tee shirt. The shirt itself is just a basic long sleeved cotton tee, but for once I am happy to report that the sizing is perfect! I received a size L and as a unisex shirt, this is exactly how it should fit. It looks a little funny in the photos but I kept one sleeve down so that you can see just how long it is. This shirt is so nice and roomy that it is perfect for lounging around in or throwing on for a light extra layer on a chilly day. I like that they included the Crate of Good hashtag on the side and I think the design does a great job of drawing attention to Ele’s Place and highlighting the important work that they are doing. Verdict: What an incredibly special box this Crate of Good was! I really love everything that this box stands for and how every item makes an impact in some way. 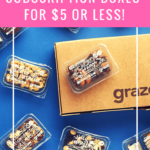 This is a box that you can feel really good about supporting and I love that it doesn’t just support one cause, but four, and even better, that subscribers get to choose the cause that is most important to them. The quality of the items was great and I thought they were pretty universal, which can be a tough thing to accomplish! While I was really happy with the items, I think that including those cards which highlighted each cause was what really gave me that good feeling. This box costs $59.99/quarter (plus free shipping) and I wasn’t able to find actual retail values for these items since they were exclusive to the box, but if we assign an average value to these 5 items, that gives each item an average value of about $12. I think this is a great value because while it might be a bit high for the bracelet and bar of soap, the long sleeve tee and sunglasses are probably worth more than that. Not to mention, the impact from including these items in the box is just as valuable to me! I think the Crate of Good team did an amazing job of finding unique organizations and causes that are really making an impact in the communities they serve. You’ll notice that my impact code is to support the mission of Poverty and while it was a tough choice for me, I ultimately based my decision on the fact that I think everyone should have access to clean water since it is a necessity for us all. After reading about the other causes, though, I really think you can’t go wrong! What cause would you choose? Can you still get this box if you sign up today? Yes, as of publication this box is still available! Value Breakdown: This box costs $59.99 + free shipping, which means that each of the5 items in the box has an average cost of about $12. What do you think of the Spring Crate of Good box? How do subscribers rate Crate of Good? Do you subscribe to Crate of Good? Add your rating now! Wow what a great idea for a box. I like that they sent things you can actually use. Wow. What a wonderful box!! And the first I’ve heard of it. I think lots of organizations have the idea to do boxes like these full of goods from charity organizations, but mostly they fill the boxes with a bunch of… well, stuff. But all of the items you received are highly functional and attracted. I’m definitely interested! Thanks Beth! Nicholas here from the CoG team! Let me know if we can answer any questions about the box! Great review of a very cool box. What a wonderful thing those 4 guys are doing. I was wondering how they could fit a box spring in there; I know you can get a mattress in a box, but a box spring? Oooohhhhh. Thank you I so did not catch that. I love the positive impact that the founders of this box and the organizations make to our world. This is definitely a box that I can and will support! The items that you received look fabulous! Thank you for reviewing such a great sub box…I’m off to subscribe! IKR! I was in awe reading the causes. Not to mention such cut models! Thanks for reading, Kris! 🙂 Hope you enjoy your box as much as I did! Hey Kris! Nicholas here from CoG! Pumped to hear you are going to subscribe! Let me know if you have any questions at all about the box or the mission! Be speaking soon! "Just have to add that sometimes when I am having a snack of butter and bread, I still think of this book. The on..."
"As a kid, I loved Heidi. I would day dream that her life was mine and spend hours looking at the cover. This box..."
"Instead of the eye cream I got a lip balm duo. I will not use a single thing in the box. I was hoping for the IT..."